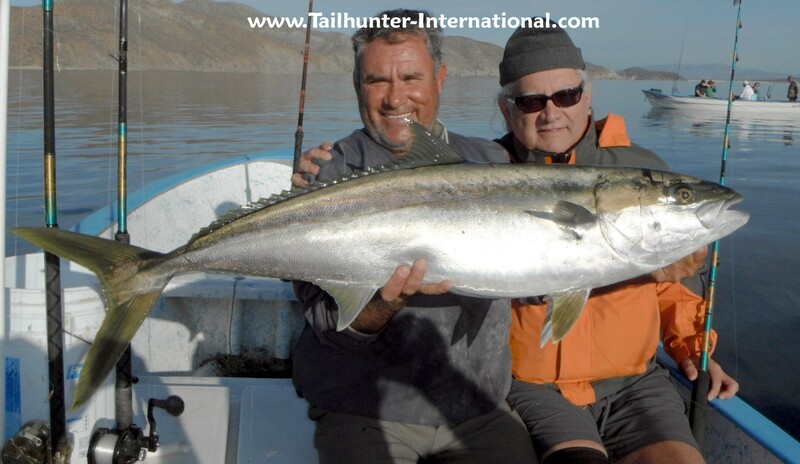 More fat yellowtail were the story of the week with fish like Jorge Romero's 40 pound class toad yellowtail he caught just off Punta Perico just south of the Las Arenas lighthouse. 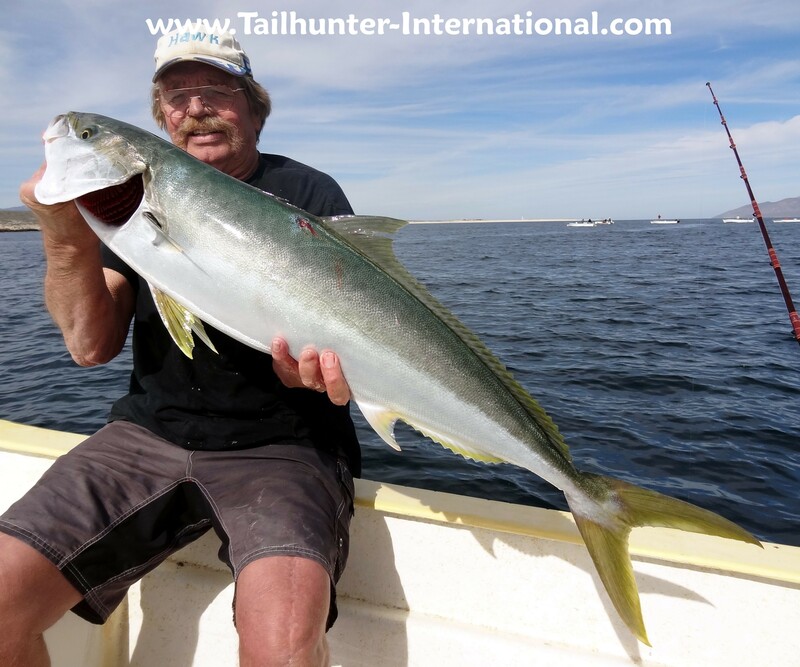 Always into big fish, Roger Thompson, shows off another big yellowtail taken this week where except for a few days when the winds kicked up, the yellowtail were on the chew earlier than normal this year! Roger was working the hot spot at the north end of Cerralvo Island. A MONSTER of a sheephead! 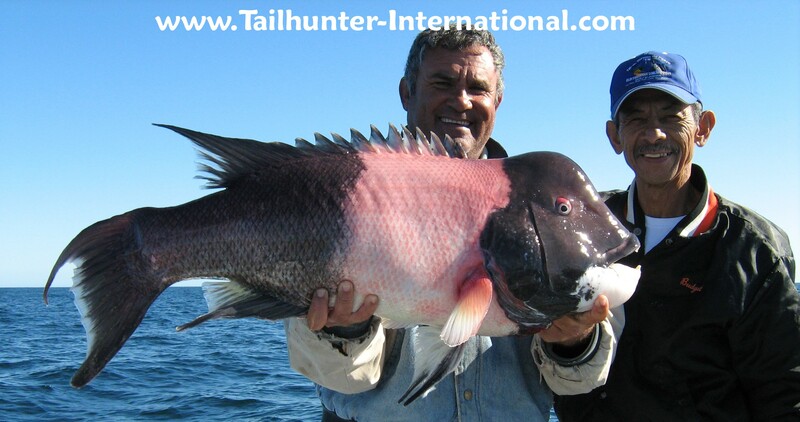 Rene Jueng and Captain Fernando show off a huge sheephead they caught just outside of Bahia de Los Muertos. In all my years in La Paz, I've only seen a few...even while scuba diving! I've seen them in other places, but surely none this huge in our waters. 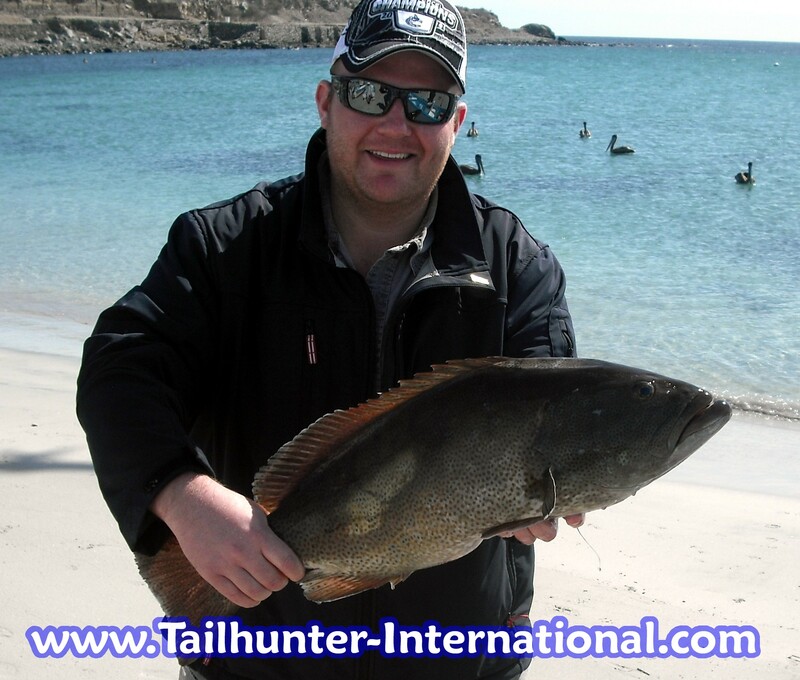 This is a great eating fish and a trophy-sized sheephead. Fishing THAT good? 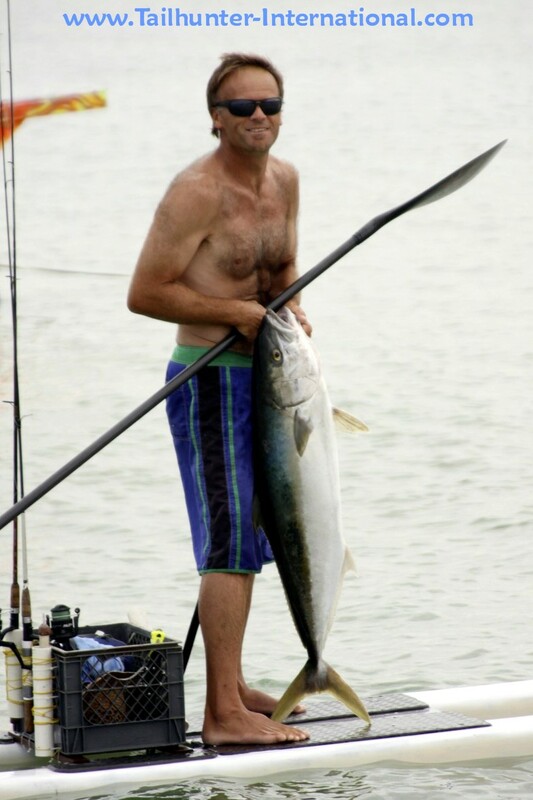 Here's another shot you won't see often...yellowtail caught on a paddle board? Yup! 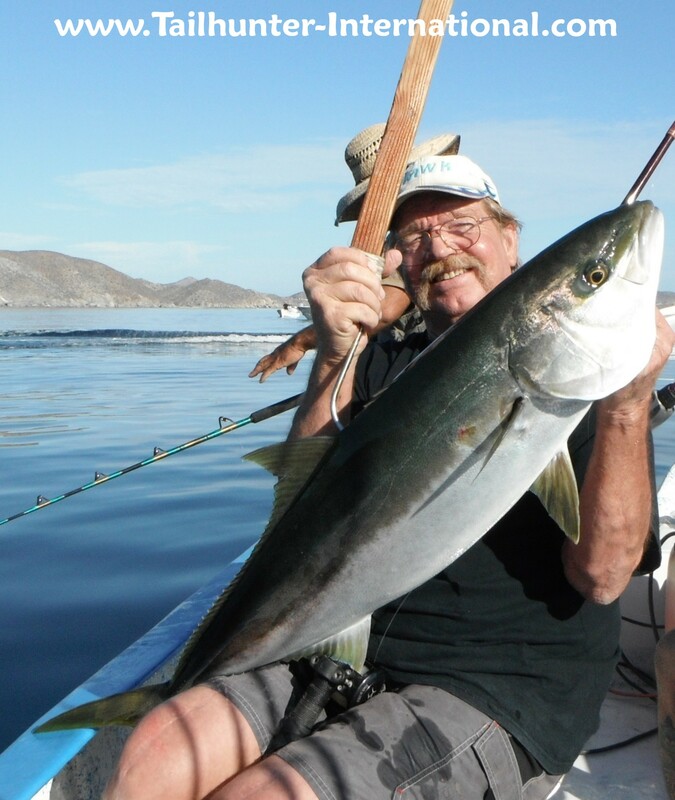 Jerry Tomasek who has a place in La Ventana caught this yellowtail in about 20 feet of water in front of La Ventana. He fought the fish 1 1/2 hours and the fish pulled him over 2 miles offshore! The next day...he did it again! He caught the fish on a live ballyhoo he caught on a jig! Donna Thompson is making it a habit of latching onto big cabrilla. 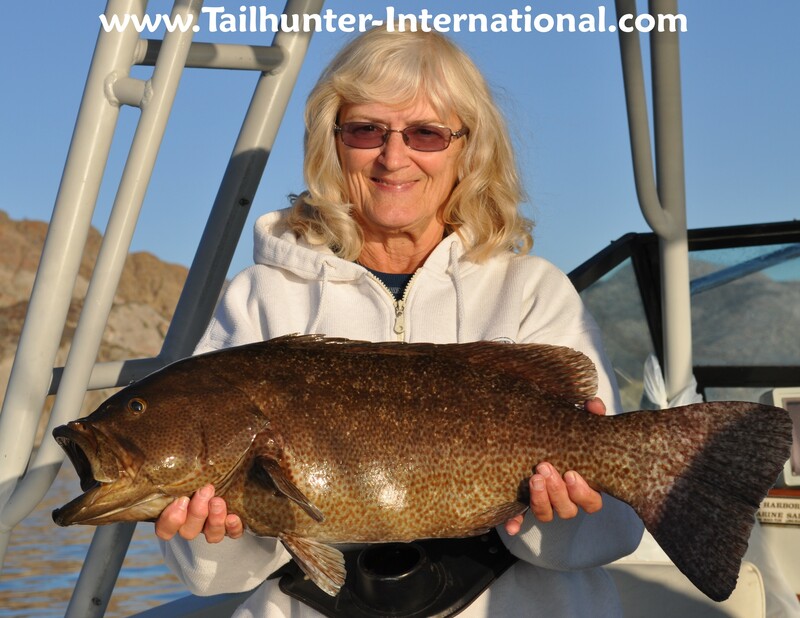 She did it again this week with this big guy off the north end of Cerralvo Island. If he looks a little familiar, actor and outdoor TV show host, Rick Kasper, has his own hunting TV show and is often a character actor on many TV series plus he used to be an acting-double for Gary Bussey. 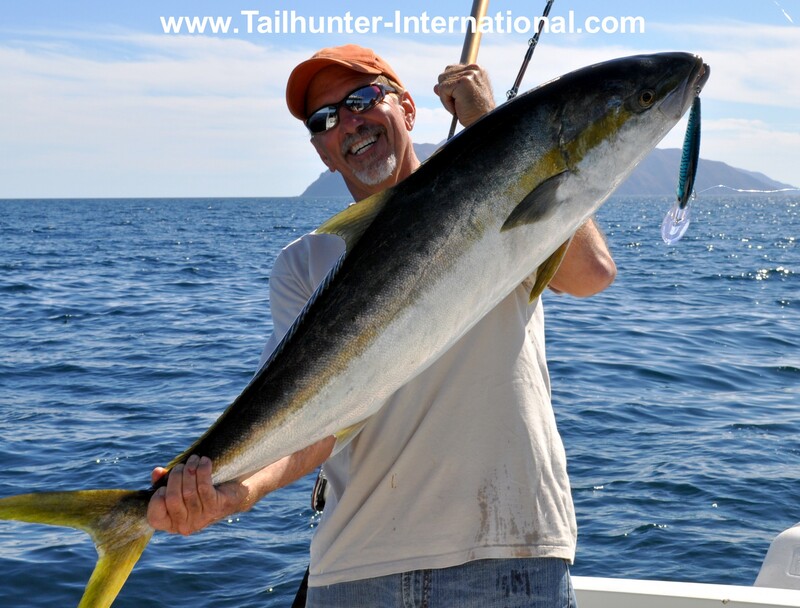 He does pretty well at fishing as well and got into our yellowtail bite showing off two of the 4 nice jurel he caught with our fleet just out of Bahia de Los Muertos! Just another tough day of fishing. Floy and Park kick back on the sand at Bahia de Los Muertos after a big day battling the yellowtail. We're moving on to Las Vegas this week! 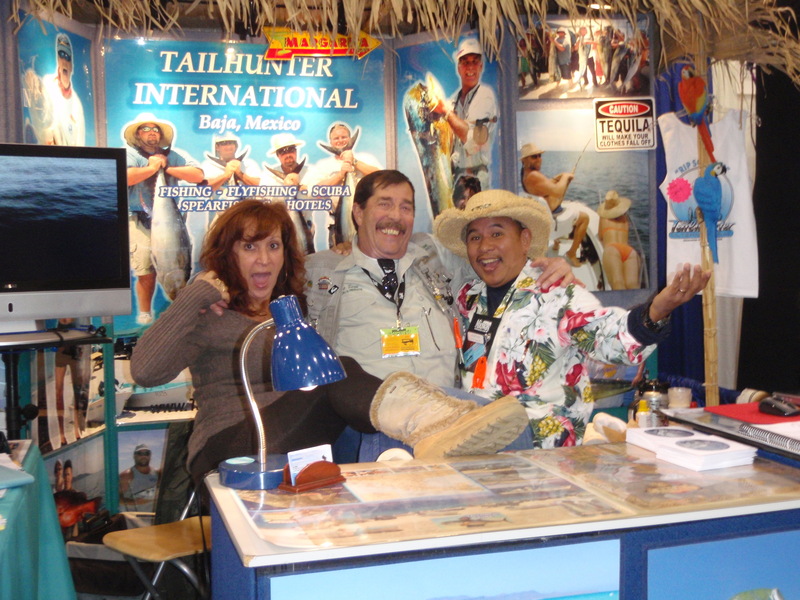 The Tailhunter International Road Show moves from Washington where we had an incredible 5-day run at the Washington Sportsmens Show in Puyallup WA. We'll be in Las Vegas at the ISE show at the Vegas Convention Center this week at Thursday, Friday, Saturday. Come say hi. Amigo Bob Le Beau mugs in our booth for the camera! 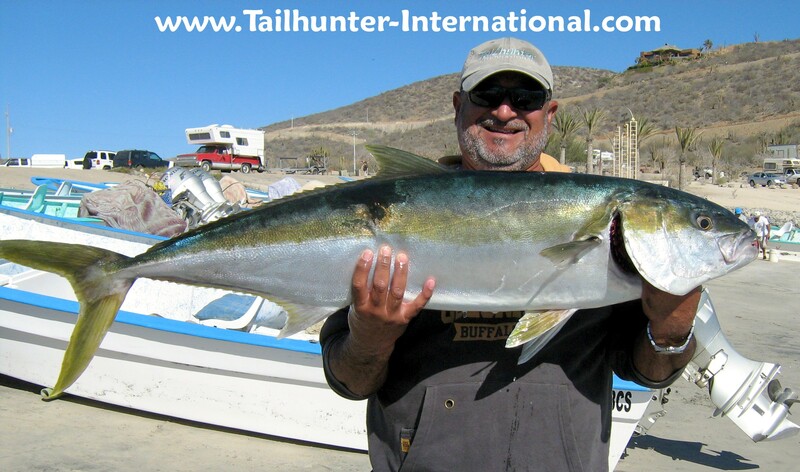 SPOTLIGHT SHINES ANOTHER WEEK ON HOT YELLOWTAIL BITE! It was another productive week…at least for ½ the week. Early in the week conditions were excellent and we got into more of those nice yellowtail and pargo. However, by the time mid-week showed up, the days started out nice, but my mid-morning, the winds were up and howling. Seas were up and choppy and just as well to either head back in or not to have gone out at all. Pretty typical for this time of year. But then again, as the weekend drew near, conditions settled again and the bite turned on again! When the bite was one, boats averaged 1-5 fish each. These were 15-45 pound fish eating live sardines, mackerel, jigged heavy iron and deep diving Bomber, Yo-zuri and Rapalas over areas deep enough to drag the deeper running lures. It seems the larger fish were closer to to Cerralvo Island with fish averaging about 30-40 pounds. The “smaller” fish…but still tough…15-30 pounders were found just outside of Muertos Bay, Punta Perico and Boca de Alamo. Inshore, the cabrilla, jack crevalle, sierra, bonito, snapper keep it fun, but the focus has been on the big pargo that, like the yellowtail, appear to have shown up earlier than usual this year. The big mullet snapper pargo are ranging over the rocky areas in water as shallow as just a few feet as they come in to spawn. The big fish are ranging from 10-20 pounds, but larger ones are tough to get out’ve the rocks! TAILHUNTER ROAD TOUR HEADS TO LAS VEGAS THIS WEEK! We want to thank all the amigos who came to visit us and chat at our booth this past week at the Washington State Fairgrounds in Puyallup, Washington at the Sportsmen’s Show. Great five day event and we enjoyed our time! But now…our 4th city stop on the Tailhunter Tour. We roll into Las Vegas for the Vegas International Sportsman’s Expo held at the Las Vegas Convention Center this Thursday, Friday, and Saturday. Come by and say hi and come pick up your copy of our new 24 page brochure and DVD as well as our new logo Tailhunter T-shirts! Whoo-hooooo! Parks from Colorado came up with this nice yellowtail just outside of Bahia de Los Muertos where flat waters kept the hot yellowtail bite rolling with 15-30 pound fish! Uno mas! 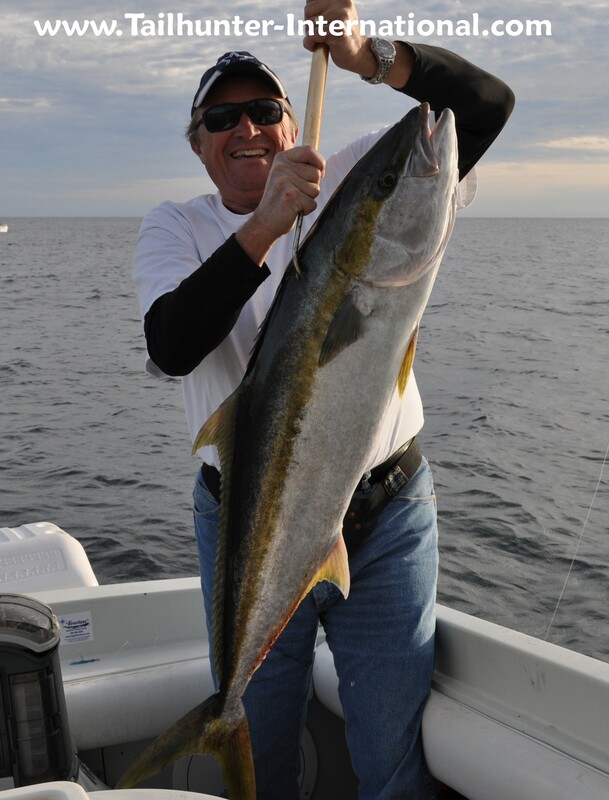 A fat jurel (yellowtail) for Bob Day who scored with this off Cerralvo Island. Ideal conditions this past week helped keep the yellowtail bite on the roll, especially around Cerralvo Island. James "Hawk" Davis is getting to be a regular poster child on the Tailhunter Fishing Report. Thanks to him also so often for such great photos like this one with another yellowtail over the rail. Close cousin to the yellowtail (and some people say better table fare!) 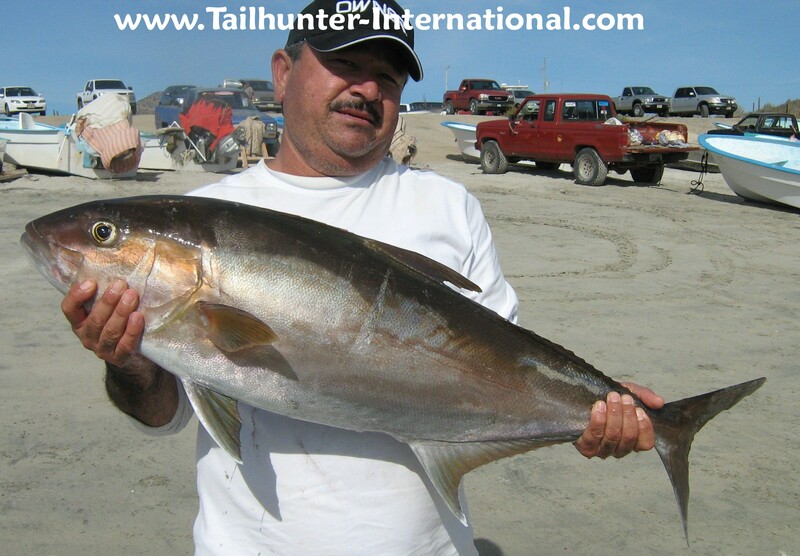 amberjack are also on the feed around Bahia de Los Muertos. Some of these fish can get over 100 pounds. This one by our amigo, Esteban Romero, isn't quite that big, but it's the right size for his grill! The yellowtail have arrived a bit early this year, but the pargo are also in numbers inshore and on the spawn. 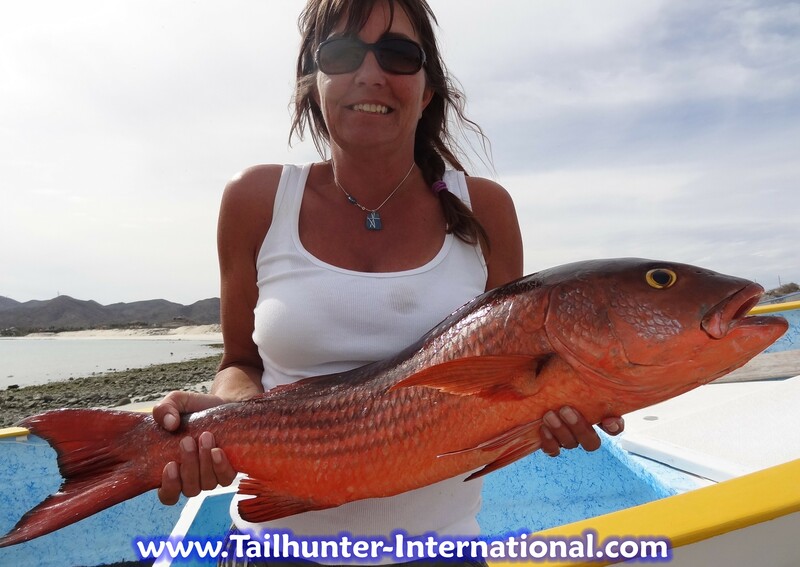 Cindy Hunt holds up a tough hard fighting pargo liso (dog snapper). These fish are literally in just a few feet of water and catching one out of the rocks is quite a conquest! 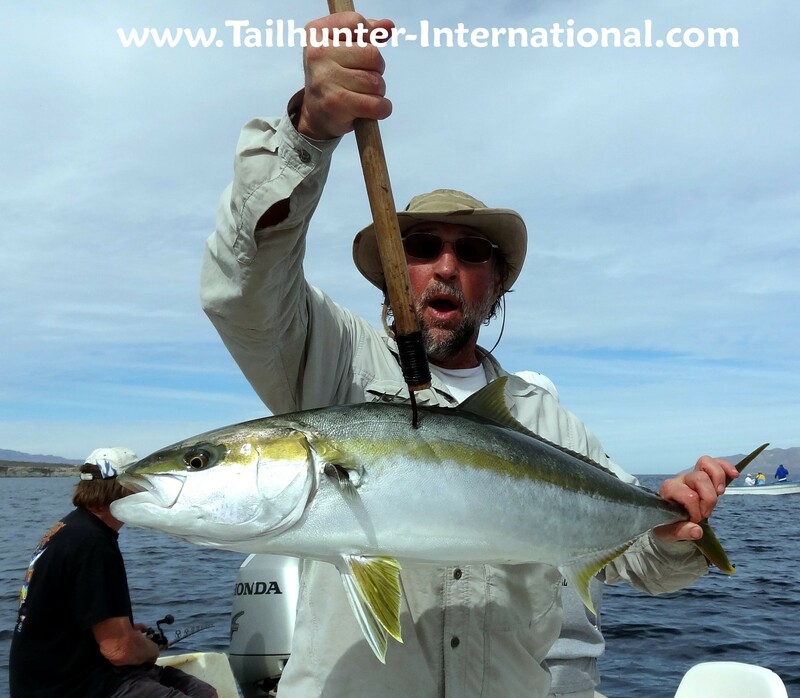 A long way from North Carolina, Floy puts the gaff to one more yellowtail this past week. Click the link above to get a video-clip view from the inside of the Tailhunter booth this past week at the International Sportsman’s Expo show at the State Fairgrounds in Sacramento. 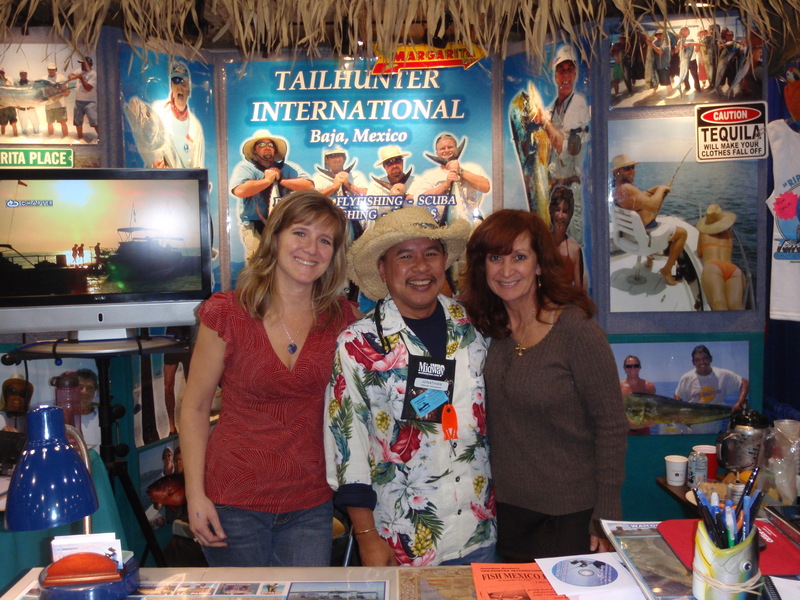 Thanks to everyone who came by to say hi and book their 2012 fishing trips to La Paz! The Tailhunter Road Show now heads north up to the Pacific Northwest to the Washington State Fairgrounds at Puyallup, Washington going on through Sunday. 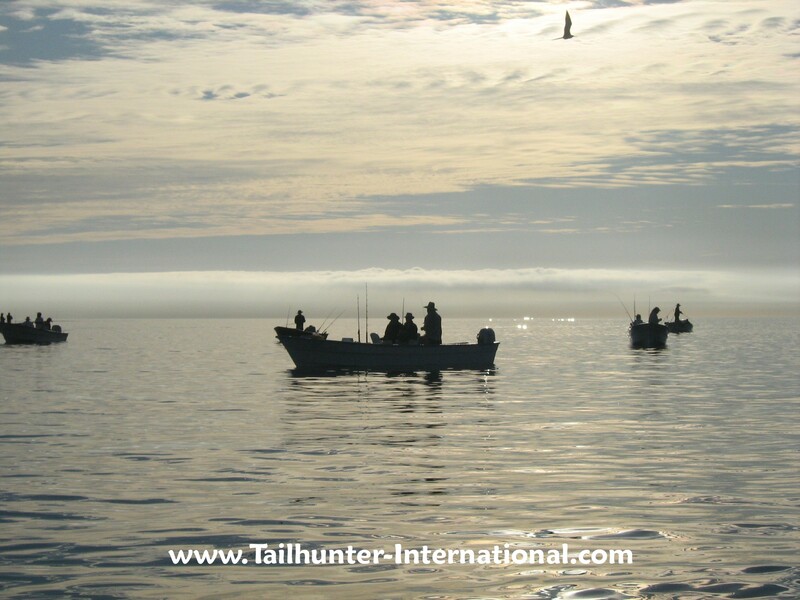 Stop by to say hi and pick up this year’s Tailhunter DVD and 24 page action brochure! YELLOWTAIL and BIG PARGO KEEP BITING AS LONG AS THE WIND STAYS AWAY! Great inshore fishing continued to dominate the La Paz/ Las Arenas fishing scene this past week again with continued bent rods on the featured yellowtail and pargo. The fish are surely here a bit earlier than normal. Fish of this quality and quantity usually don’t show up for another month or two! No one’s complaining…except those anglers seeing the reports lately and wishing they were in La Paz waters getting into this great bite. The week started a bit sluggish for the big boys, but still some nice action on the bonito, cabrilla and smaller pargo. Buy any standards, half-way decent fishing action for this time of year! However, by mid-week the yellowtail were again crashing just off the inside waters around north and south Cerralvo Island plus a nice jag of fish just off Punta Perico in that rocky areas between Muertos Bay and the Las Arenas lighthouse. These were a nice grade of yellowtail. The larger fish up to 30-40 pound seemed to be closer to the spots around the island. “Smaller’ fish (up to 30 pounds) were the ones taken near Bahia de Los Muertos, Punta Perico and Boca de Alamo just to the south. Mackerel seem to be the prime bait, but sardines and casting yo yo iron on the fast crank using blue/white; brown bait; and scrambled egg patterns have been steady producers. In addition to the areas of yellowtail those same rocky areas are still kicking out early-season pargo as well. Some of the fish appear to literally be mere feet from the rocky cliffs and shorelines. But that’s because they ARE that close. I often tell folks it looks like a Japanese kio pond with 10-50 pound fish gone on steroids as the big pargo (snapper) start roiling and boiling in the chum lines and many large fish we never see simply because they are too big and the rocks beneath the surface are too close and can shred mono leaders like mere thread. They’re a frustrating fish! I’m still hearing reports from the commercial guys of some fast-moving tuna at the north end of Cerralvo Island with fish up to 100 pounds greyhounding. But, none of the sport pangas have been able to get on them. We’ll keep you posted! James "Hawk" Davis is one of our regular amigos and living in La Ventana gets out quite a bit. He got into the nice yellowtail bite that has shown up a bit earlier than usual. Note the flat waters behind. Absence of wind seems to be the key! Showing great form...especially on light tackle, Damon Davis, an experienced skipper and deckhand from S. California visiting his dad, shows how to put the wood to the pargo that have started spawning in the shallow waters near the rocks. Note how close to shore he is and why it's imperative to turn these powerful fish before you get cut off! ....and this is what you get when you do it right and add a smidgen of fishing luck as well. Damon shows off the nice pargo liso off Punta Perico. First-timer Bob and Captain Fernando fishing off Punta Perico pose for a a photo with one of the fat yellowtail we started getting about 2 weeks ago. We just wrapped up a completely fantastic week in Denver a the downtown convention center at the International Sportsman's Expo. Probably the BEST Denver show in our 13 years there. Great to see so many old friend and welcome aboard new amigos as well! No we head to the ISE show in Sacramento at the California State Fairgrounds Jan. 19-22nd. Details below! 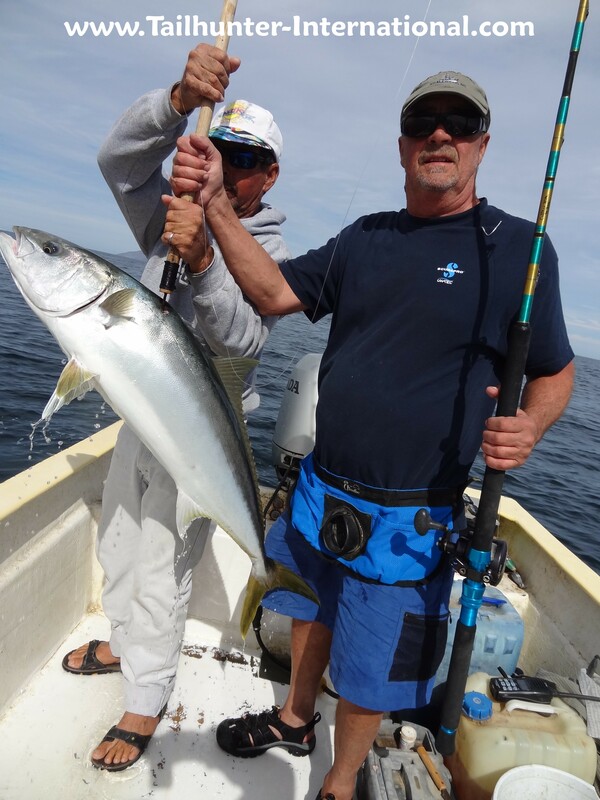 YELLOWTAIL AND PARGO AGAIN SPARK THE EARLY SEASON BITE! Despite the full moon, it turned into a pretty decent week of fishing. Except for a few days when it got a bit blustery in the afternoons and it got difficult to stay on the spots, fishing for inshore species remained solid. Big pargo up close to the rocks near Punta Perrico continued to bend rods and break hearts as big fish often took guys into the rocks frustrating even the most veteran anglers. 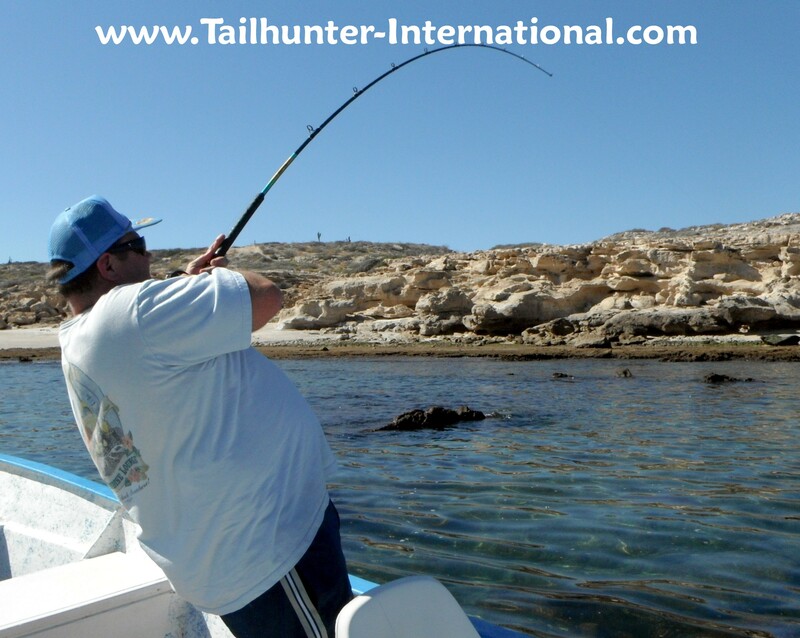 However, as long as we could get the mackerel for bait, big yellowtail also produced south of Muertos around Boca de Alamo and also at the south end of Cerralvo Island. Fish ranged between 20 and 40 pounds with boats taking 1-3 big fish each day in shallow water. Again, that can be problem keeping the fish out’ve the rocks and turning those big heads and shoulders before getting cut off! So, the numbers are sometimes deceiving between the number of hook-ups and the number of fish put into the boxes! We’ve got some encouraging stray reports of big breezing tuna over 100 pounds and wahoo as well from some of the commercial guys working the north end of Cerralvo Island, however, shakey conditions with rip currents and high winds make it hard to fish the areas. We’re keeping an eye out! Other species rounding out the counts include sierra, cabrilla, some smaller schoolie roosterfish, lots of bonito and jack crevalle mixed with trigger fish! I’m getting alot of questions about the new VISA regulations that came down the pipe from the Mexican government at the beginning of the year. 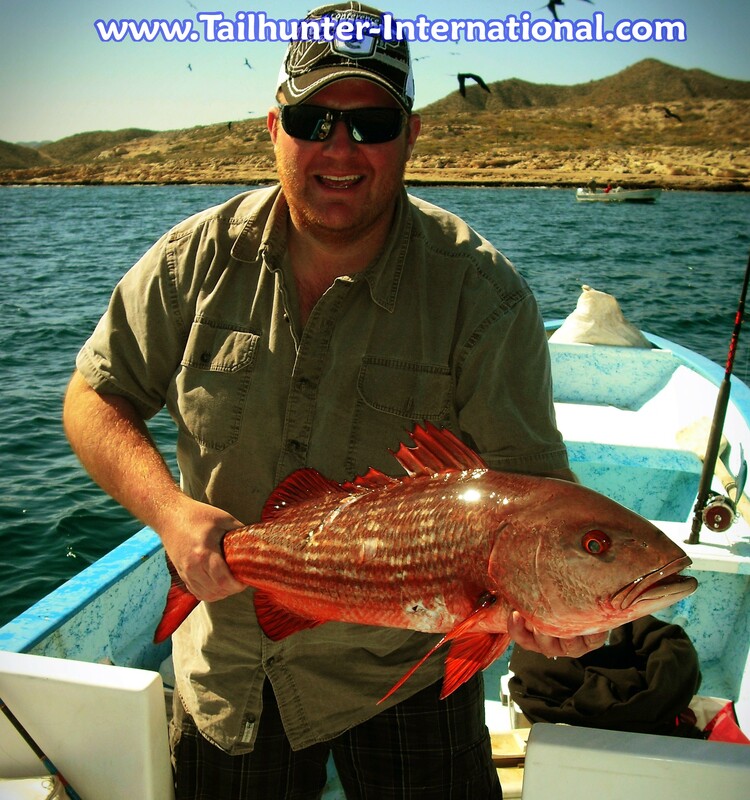 It requires that you obtain a VISA in addition to your fishing licenses in order to be fishing in Mexican waters. It’s creating alot of confusion and concern and, needless to say, not real good for bringing fishermen into Mexico. Well, for 99.9 percent of you who visit us, you already have your VISA so stop worrying. That little piece of paper they have you fill out on the airplane IS your VISA! So that’s why we always tell you to hang onto it! Take a breath. It’s OK! Next stop for the Tailhunter International Road Tour for 2012 will be the California State Fairoungds for the ISE show Jan. 19th to 22nd. This is a mammoth show. It’s the largest fishing / hunting show in Northern California and is an incredible event for anyone who likes the outdoors whether it’s hunting, fishing, boating, off-roading, kayaking, camping and other activities. Hunting dog shows. Seminars. Outdoor cooking. It’s all there. Great day for the entire family. Vendors and booths from around the world like us from Baja, Africa, Asia, Canada, South America and pretty much every state in the U.S. is there. Lots to see and learn. Great food. Lots of exhbits. 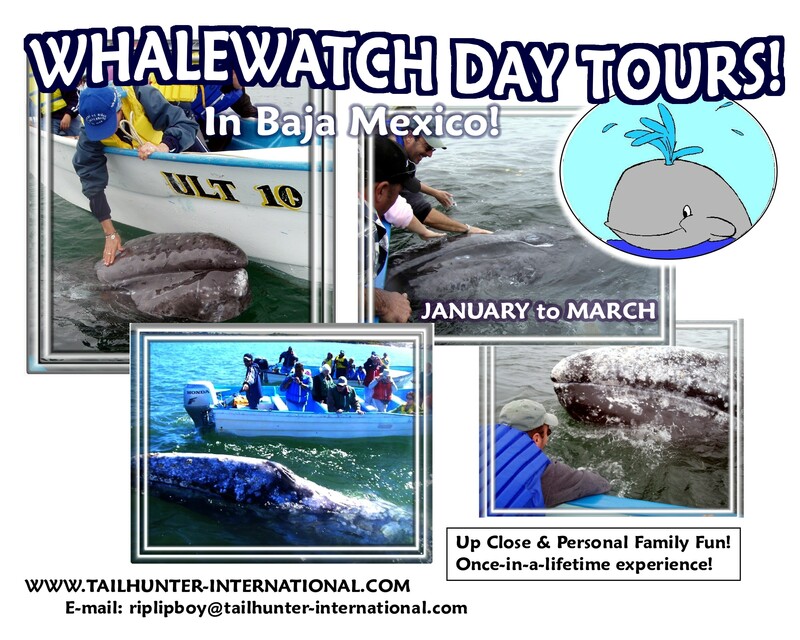 Come say hi and pick up our new 24 page brochure and DVD and talk to us about fishing in 2012 in La Paz! Bookings are coming in fast this year so let’s make sure you’re covered! We have some great show specials. 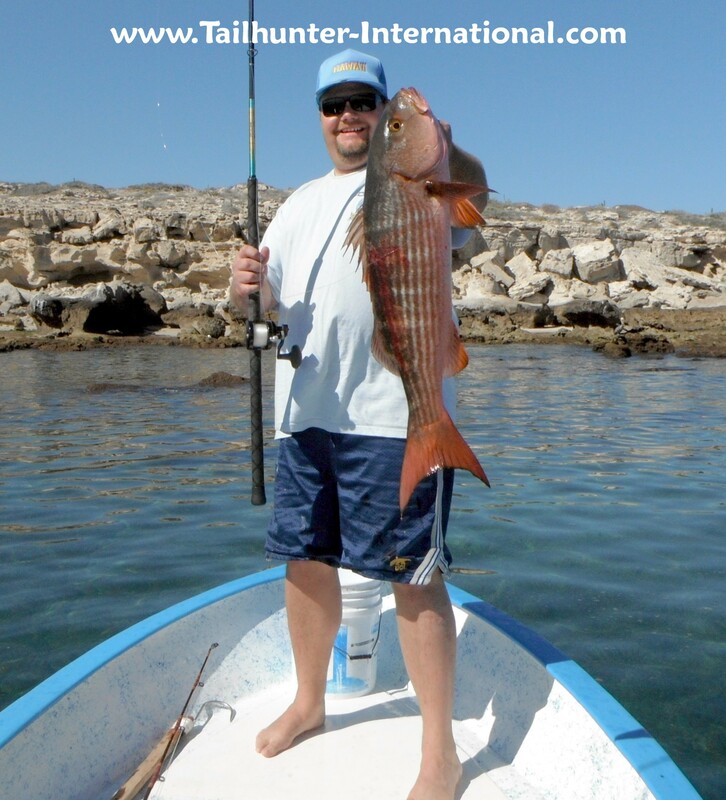 Ask us directly at riplipboy@tailhunter-international.com. I know alot of you have your favorite captains and rooms so check with us to make sure they’re not already reserved. We’re looking at a really busy year again! 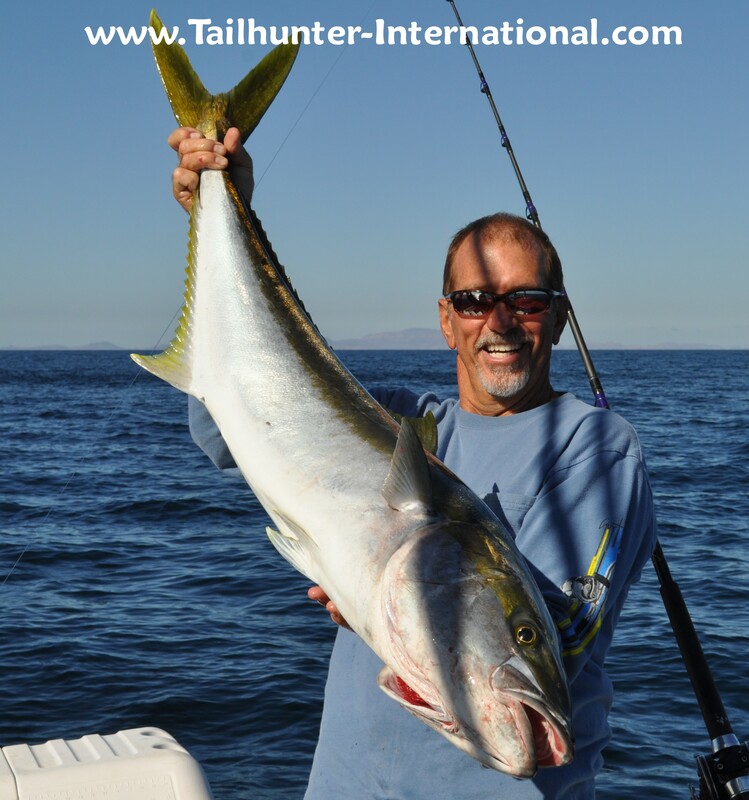 Big yellowtail were a big part of the story this past week with fish up to 35 pounds like this solid fish that Roger Thompson took on a trolled deep diving Rapala north of Cerralvo Island. 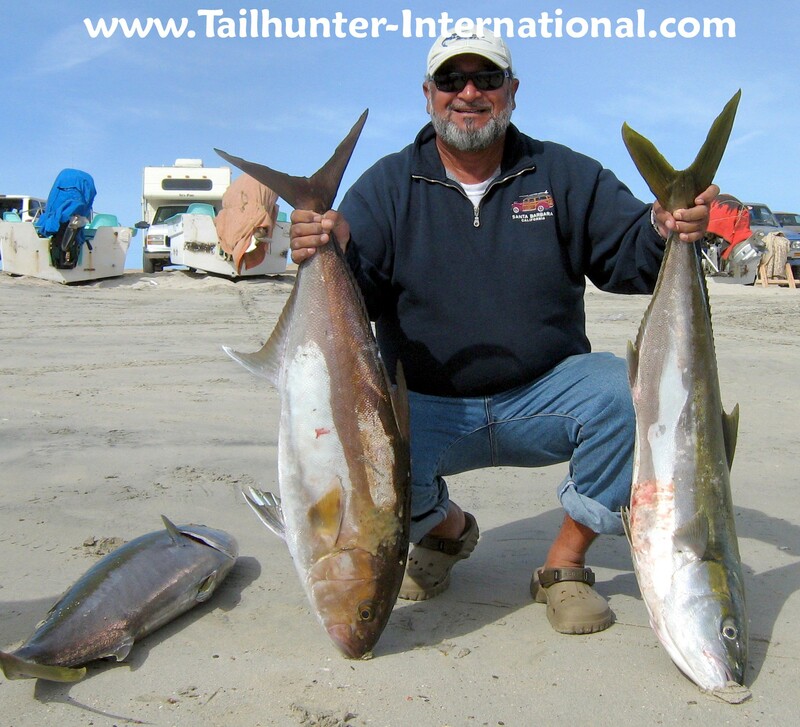 Kneeling on the sand at Bahia de Los Muertos near La Paz, our amigo, Jorge Romero not only got two slugger yellowtail, but also a nice amberjack as well...usually larger cousin to the yellowtail obviously, the full moon didn't have much effect! It's a pretty picture of the pangas at sunrise at Muertos Bay, but the key to the photo is how flat the waters are! The key to the good fishing this week wasn't the full moon, it was the fact that the winds laid down most days allowing anglers to get onto the fish! This lady can fish! 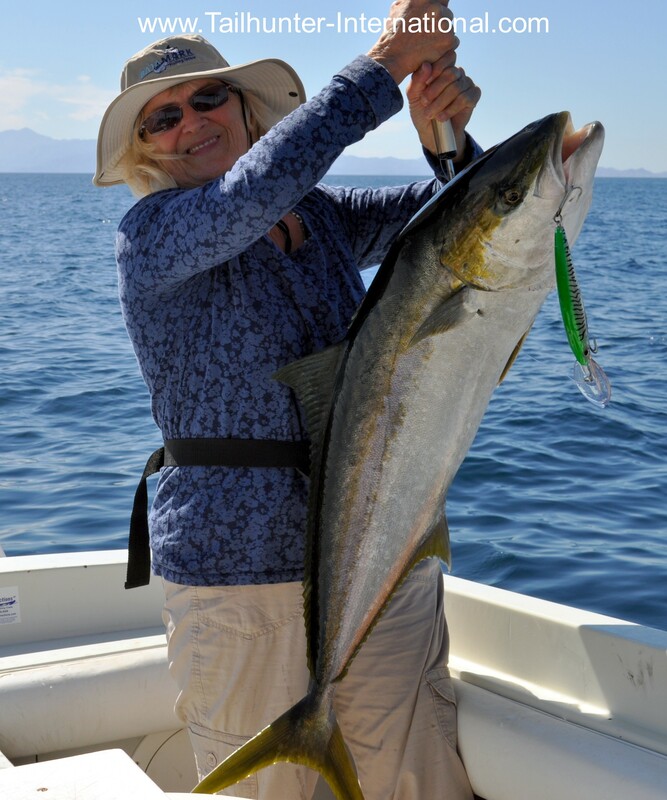 Donna Thompson always does well and she worked north point Cerralvo Island for this early season trophy yellowtail. Thanks to everyone who came by our booth at the Denver Convention Center at the International Sportsman’s Expo that wound up on Sunday. 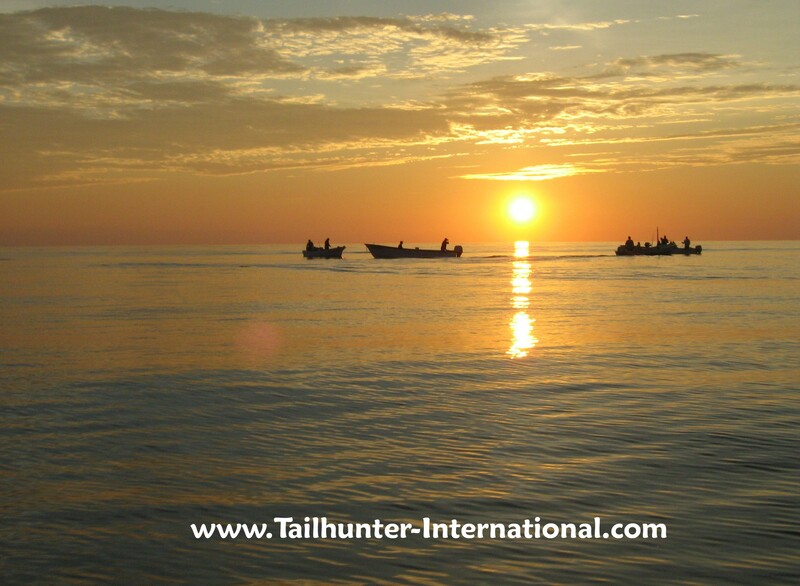 It was great to see so many of our older amigos and clients as well as meet new amigos and talk about fishing with Tailhunter in La Paz. It was our 12th year hear at this expo and Denver always treats us great! Next stop will be the Califorania State Fairground in Sacramento for the next ISE show! See you there! EARLY SEASON YELLOWTAIL and PARGO ROCK FISHERMEN FOR FIRST WEEK OF 2012! What a way to start off the new year! Winds laid down for the most part and we got a surprise bite of nice fat 20-40 pound yellowtail! The key was the wind. On the days when the wind blew, fishing was scratchy at best, but for most of the week, winds laid down and the little firecracker yellowtail we were catching around the holidays suddenly grew into the big trophy fish we usually don’t see until a month or two from now. But, no one was complaining! The fish were in several areas. North Point Cerralvo Island held fish. As did the southern area near the lighthouse. The fish were holding off the bottom but could be enticed up with live bait or slow trolling deep-diving Rapalas or Yo-Zuri Magnums (green mack patterns and silver/black patterns worked well). Yo-yo iron in blue/white and brown/yellow also got picke up on the fast retrieve. Other good areas included Bahia de Los Muertos which rocked up some nice amberjack but the fleet also took fish south of the bay in the shallow drop off areas off Boca de Alamo near the arroyo. Most of these fish were taken on live bait and iron. It looks like we’ve also got an early run of the schooling spawning pargo liso (mullet snapper) happening already too! Normally, we start seeing the fish around March or April in these numbers, and certainly, they’ll get thicker as the weeks roll in, but at least for this week, they were a big focus for us around Punta Perico near Las Arenas. The fish we’re getting have been 5-20 pounders, but larger fish are getting lost. It’s hard to tell sometimes since the fish are in shallow waters inshore in rocky areas and a quick pickup and bent rod is often followed very quickly after a few moments with strained line…some grunts…a squealing drag and a POP! As the line breaks! They’re pretty frustrating fish! But no doubt great sport. At least the good part is that in those same areas are some nice cabrilla (Mexican seabass) as well as some of the smaller yellowtail and rainbow runners showing up too and just offshore, bonito are around to at least provide fun action. 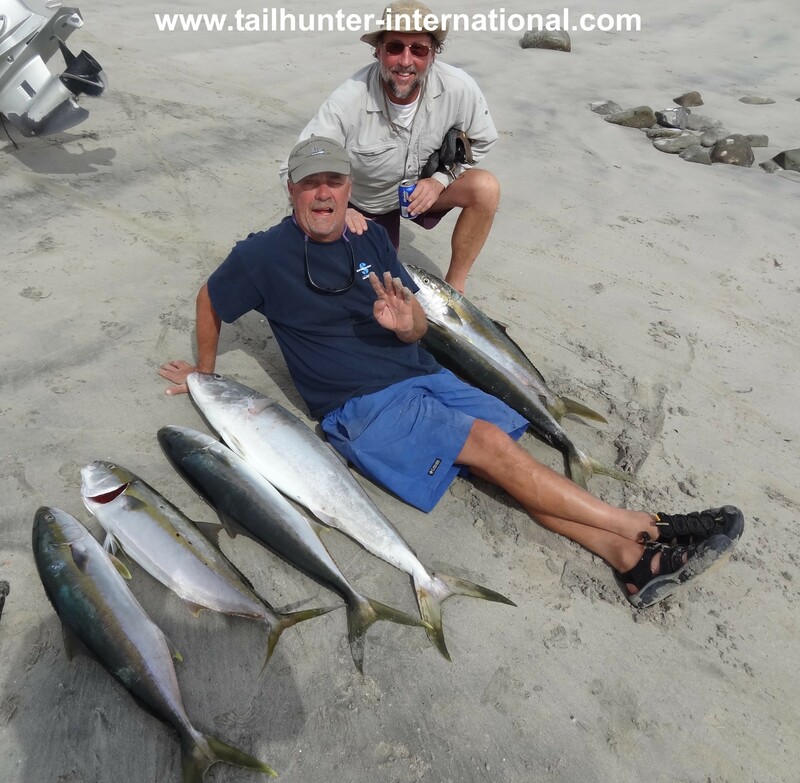 Like I said…The earlier parts of the week the winds were down and we put up good numbers with our pangas getting 10-30 fish caught and released…good fun days! Letting smaller cabrilla and bonito go but plenty of action. Then, the winds came up beginning Thursday and the counts got scratchy again. The local windsurfers love it, but not so good for fishing. Then, late in the week, even with the full moon, the wind settled again and that’s when we started getting the big yellowtail! Hope it holds up! Matt Lewis came all the way from chilly Canada to find some sunshine and fish. He spent several days fishing with us and had some great action! Look like the pargo liso have moved back in a bit early! Matt got this nice fish just off Punta Perrico. It was a great week for cabrilla (Mexican seabass) fishing! Our pangas this week averaged 6-12 fish between 2 and 8 pounds all week. Many of the smaller ones were releasd. It was also a bit chilly too...Matt is from Canada and still sported a jacket when temperatures dropping into the 40's. But Matt shows off a nice trophy cabrilla standing on the sand there at Muertos Bay. This is a different species of "pargo" than the one in the top photo. 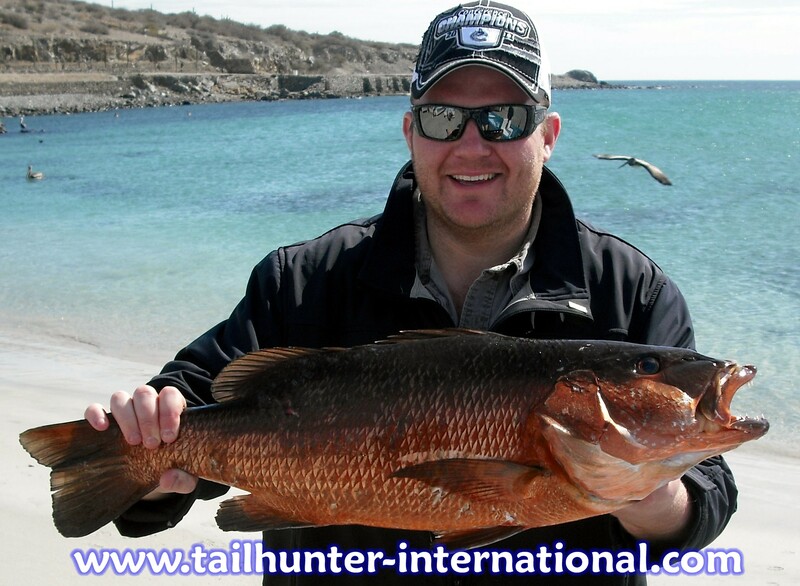 This is the "dog tooth" pargo or "cubera snapper" or "pargo rojo". The one above is the "pargo liso" or "mullet snapper." I know...confusing as all get out. But make no mistake. These are tough tough fish in the inshore rocks that makes ANY pargo a real sporting fish and an event when you get one on the boat! We had a pretty decent week on working the reefs for some good pargo action. Both Jill and I and all of the Tailhunter Tribe, Family and Staff wanted to thank you all for such a great year and for all the smiles and good times. We are blessed every single day for the privilege to do what we do and all of you make it happen. We're looking forward to and wishing all of you an even better 2012! BEST FISHES!! COLD WEATHER BUT HOT FISHING ACTION MAKE FOR A PRETTY GOOD WEEK TO END THE YEAR! We had a pretty nice week of fishing here. We may have had one of the calmest weeks for wind in a few weeks, but it sure was cold. Temperatures at night dropped into the 40’s and we advised our anglers to make sure they brought jackets. The best way to characterize the week was “action.” Nothing spectacular in terms of size, but we had pangas out almost every single day and with all the catch-and-release fish added to the counts, our anglers were getting 20-30 fish per day! That’s a lot of fun. For a lot of our folks, many of them are from really cold places like New York and Canada and Minnesota right now so just being on the water was a treat. Add in some fishing fun and it made for some good days! There weren’t any blue-water species to speak of, but what a great mix. If you start with about a dozen feisty bonito ripping you up; add in about a dozen cabrilla; half-a dozen sierra, a few small yellowtail and a pargo or two…that’s a full day of fishing! The most remarkable fish were the pargo liso which appear to have shown up early. Several larger pargo took anglers into the rocks but we did get a few in the 10-20 pound class that are horses anyway! Best spot was close…just around the corner from Bahia de Los Muertos at Punta Perrico.